As the winner of the Mercury Take A Kid Fishing boat, earlier this week Zach was presented with a new Mercury rigid hull inflatable a 9.9 horsepower motor, complete on a custom-built Voyager trailer. It came with lifejackets from RFD and Kilwell fishing tackle. Zach, who lives with his parents in Brisbane and comes back across the Tasman regularly where he fishes with his extended family, was excited with his early Christmas present. 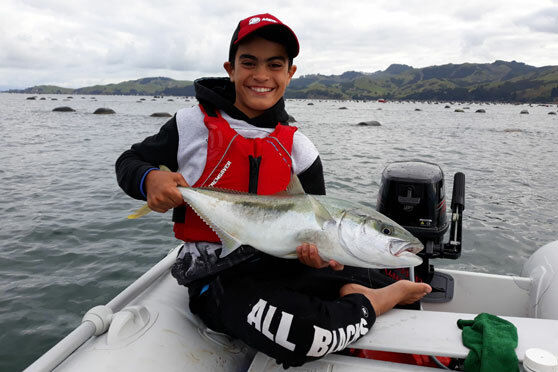 The grandson of well-known Far North charter skipper Tank Barker, Zach is passionate about his fishing and had already planned a trip to Houhora where he would be fishing in the harbour while on holiday. Zach couldn't believe his luck when he was rung by NZ Fishing News to be told of his good fortune. His dad Jason videoed the call! The boat has already been named so keep out for a young boy aboard a small inflatable with Zach Attack on its side – chances are he will be hooked into a fish with kingfish his favourite target species. "Thanks Fishing News and the TAKF page sponsors – it’s the best Christmas present ever!" Zach says. The family turned out in big numbers to see Zach and dad Jason launch Zach Attack at Marsden Cove the week before Christmas, taking it for a short run around the marina. 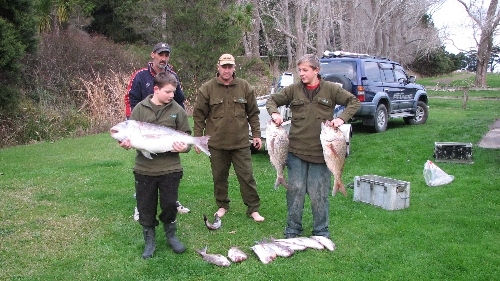 As a postscript, Zach proved true to his word, catching kingfish and snapper while on holiday in the Far North. He took his dad out for a free dive in Whangarei harbour where they gathered a feed of tasty scallops – the Mercury has hardly had a chance to cool down!